TALLAHASSEE, Fla. ⎯ Florida State University marine biologist David L. Kimbro will lead scientists from Florida, Georgia, North Carolina and Maine in a massive effort to study the health and future of the nation's natural oyster reefs in 12 estuaries spanning 1,000 miles of Atlantic and Gulf of Mexico shoreline. The multi-institutional project, which kicked off June 1, has become even more vital now following the calamitous Gulf oil spill that began in April. Funded by a new, three-year $850,342 grant from the National Science Foundation's Biological Oceanography Program, the study is expected to guide restoration of what were already the world's most devastated estuarine habitats while producing important information on the oil spill's effects. Some of the scientists' work will be documented on public television. "Our forthcoming research will be critically important because oysters promote healthy estuaries by filtering water and increasing the diversity of economically important fishes and invertebrates," said Kimbro, a postdoctoral associate at The Florida State University Coastal and Marine Laboratory. "In turn, healthy estuaries support a lot of economic and recreational activity. "But, having been decimated by historical overfishing, disease and poor water quality, natural oyster reefs are now the most degraded estuarine habitat worldwide, with only about 15 percent of global oyster reefs remaining," he said. "Unfortunately, here in the United States, we've eaten and dredged away most of the oyster habitat." Before harvesting began along the U.S. Gulf and Atlantic coasts, oyster reefs probably maintained estuarine health by filtering enormous volumes of water, cycling nutrients, and increasing biodiversity and system productivity, Kimbro said. 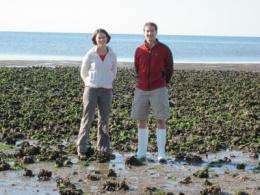 Although considerable funding and effort have been devoted to restoring oyster reefs in estuaries up and down the Atlantic and Gulf coasts in order to mitigate the declining trend of estuarine health, Kimbro said it's not currently clear why some restoration projects fail and others succeed at improving diversity and ecosystem functioning. "Consequently, it is difficult for resource managers to determine where and to what degree restoration should be pursued," he said. "Our study will seek to create a biogeographic framework to help resource managers decide where and how to focus our nation's restoration dollars. We will be focusing on natural oyster reefs rather than restored ones, but our information will be able to help guide future restoration efforts." The researchers will investigate the degree to which differences in predators -- fishes and invertebrates -- and climate among Gulf and Atlantic coast estuaries act to control estuarine health by altering both the number of oysters and the amount of water they filter. "In natural oyster reefs, predators such as fish and large crabs can protect oysters either by eating the smaller snails and crabs that consume the oysters or by scaring the snails and crabs enough to spoil their appetite for them," Kimbro said. "Doing one versus the other may determine not only whether more oysters are in certain locations but also whether those oysters filter a lot of water -- because they can sense the presence of predators and won't open up to filter water when their consumers are around," he said. "The amount of water oysters filter matters, because it directly affects an ecosystem's nutrient cycling rate." As the study's principal investigator, Florida State's Kimbro will direct the project's four research teams, comprised of marine ecologists and ecosystem scientists compiling oyster reef data in a dozen estuaries along the Atlantic and Gulf coasts, including several in Florida. Heading the teams are FSU Coastal and Marine Laboratory marine ecologist Anne Randall Hughes and scientists James Byers, of the University of Georgia; Michael Piehler, University of North Carolina-Chapel Hill; and Jonathan Grabowski, of the Gulf of Maine Research Institute. The project's design is "academically novel," said Kimbro, in part because it will integrate the fields of experimental community ecology and ecosystem science and do so over an exceptionally large spatial scale of almost 1,000 miles. "And, now, the oil will become a part of the system and patterns that we detect," Kimbro said. "As a result, we are quickly integrating ideas on how our project can be used to not only quantify the environmental injury caused by the oil spill but also as a means to learn how large disturbances organize ecological systems." As the NSF-funded study gets underway, Kimbro also is pursuing a grant from a Florida-based organization that would enable his teams to take additional samples of the entire food web at all research locations throughout the state -- including two sites with oil, on the Gulf, and two on the Atlantic, presumably with less oil. Stable isotopes would then be used to determine background levels of hydrocarbons and connections throughout the food web. Kimbro said the researchers would continue to collect those kinds of data throughout the course of the NSF study, especially as the oil hits. "We will then be able to see not only the immediate impacts of the oil -- for instance, when an entire oyster reef is overcome, and dies -- but also how the diet composition of larger species, such as fish, changes as the sources of their normal diet are destroyed or drastically altered," he said. "Within oil impacted areas, we expect not all shorelines will be damaged," Kimbro said. "As a result, we also expect undamaged shorelines to serve as a very crowded refuge for animals fleeing oiled sites that in turn may throw the balance of the undamaged food web out of whack. So, there will be indirect effects of the oil spill that will likely filter over into untouched habitats. "Finally, we will collect the same types of samples in salt marsh habitats to determine if one habitat and its food web has been affected more than the other," he said.